The GASIG met Saturday, May 12, at Mac Business Solutions, Gaithersburg, Md. 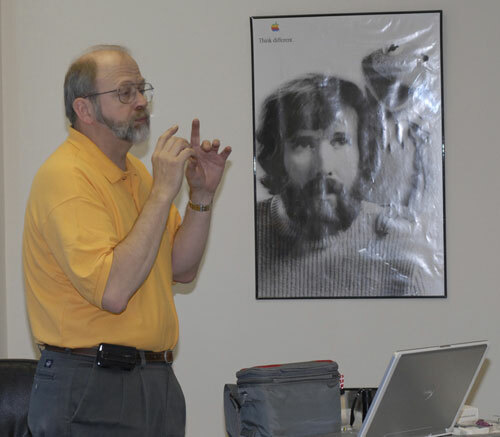 Michael Giagola continued his series of presentations with “Color Management Fundaments, Part I.” In essence, what he wanted to get across was an understanding of the concepts of how to get printed images to look like the images on the monitor. To do this, he talked about digital color reproduction, color space, ICC profiles, and color-managed workflow. Michael Giagola talks about color space, aided by Jim Henson and Kermit. Photo by Richard Sanderson, taken with a Nikon D-200 digital camera. Michael continues this series in June, with Color Management Part II.